Homemade Banana Cake- a delicious, moist and flavorful cake filled with banana flavor and topped with a delicious cream cheese frosting! 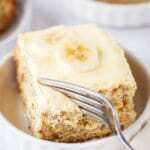 This banana cake recipe has been used for birthday parties, holidays and even weddings! Grease and lightly flour two round pans or a 13x9 cake pan. Cream shortening, banana, sugar, and eggs together until light and fluffy. Add milk and vanilla. Combine flour, baking powder, baking soda, and salt and add to wet mixture. Beat for 2 minutes on medium. Turn batter into pans. Bake at 350 degrees for 30 minutes or until done. Allow to cool before frosting. Beat together butter and cream cheese with electric mixer until smooth and creamy. Beat in Vanilla and powdered sugar until desired consistency is met. You may add a touch of milk if frosting gets too thick.